Many of us blame our memory when it comes to doing dictation. “I could not remember the last part of the sentence”. These are some of the common complaints we hear from students. But is it really about memory? Do you need to improve your memory to answer these questions? Actually no. Dictation is not about how well you can remember (although having a good memory is helpful). It’s all about how familiar with English. There are many ways you can improve your skills in dictation. First, you can try breaking the sentence into meaningful phrases. Then, you can practice one phrase at a time. You will have to pay fine if you do not return your books on time. However, there are so many possible combinations of these phrases, you may feel overwhelmed at the beginning. 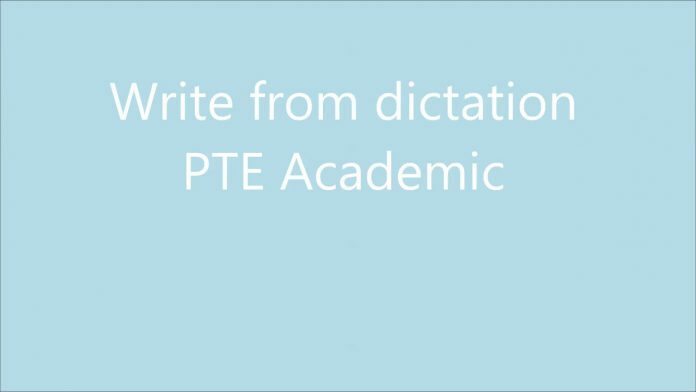 Fortunately, PTE uses the same set of 200 sentences all the time. If you know these sentences, you can get excellent score in this section. Here we are providing you 20 such sentences. If you want to find out all 200 sentences, read until the end. In the last few weeks, we have been looking at various aspects of the social history of London. Being a student representative on the union really cuts into my study time. Books which are overdue will incur daily fine. A periodical is a publication that is issued regularly. Visual aids can make presentations clear and more interesting. Without a doubt, his primary motive was economic growth. Successful applicants will work with a large team of researchers. Sydney is Australia ‘ s largest city, chief port and cultural center. The arts magazine is looking for a new assistant editor. The conference is predicted to draw greater numbers than last year. The date of the invention of the first clock is disputed among historians. The Drama Society is now auditioning for parts in the student play. The fertile planes in the east of the region provide excellent land for farming. The financial report for the last quarter will be available this afternoon. The fire left the area almost completely devoid of vegetation. The initial results are intriguing; however, statistically speaking they are insignificant. The law library is closed on Sundays and public holidays. The lecture on child psychology has been postponed until Friday. The lecture will deal with the influence of the technology on music.